Cole Stevens Salon believes that a person’s true beauty comes from within. “Our job at Cole Stevens is not finished until you look and feel as beautiful on the inside as you do on the outside,” says CEO and Owner, Diane Cole Stevens. At Cole Stevens, we believe in providing a luxury experience in a warm & welcoming environment through our solution-based consultation, effective execution of services, and by creating a partnership with our clients to best achieve their hair care goals. Cole Stevens is a leader in luxury hair care, with an innovative approach to cuts, colour and amazing treatments for all hair types. It has become a global industry leader on textured hair under the tuition of Diane Cole Stevens. The Cole Stevens Team is dedicated to providing an exceptional salon experience and creating a distinctive portrait of style for each individual through continuing education and industry innovation. Internationally recognized hair cutting and design leader, Diane Cole Stevens, has interchangeable roles as creative stylist, top educator, business entrepreneur and philanthropist. Diane’s impeccable reputation for hair artistry and an academic approach to the study of hair texture have revolutionized the cutting and shaping of hair. Armed with a business degree and years of professional hair care, business management and marketing experience, Diane used her savvy business acumen to create two of metropolitan Washington’s most highly sought beauty destinations. Her expertise also offers effective salon management, marketing best practices, revenue growth, profitability and work-life balance instruction to salon owners and stylists throughout the United States and abroad. Diane Cole Stevens is Founder and CEO of The Cinderella Foundation; Owner and Artistic Director of Cole Stevens Salons in the Washington DC metro area; Nioxin Top Artist; Ambassador for Procter & Gamble’s Hairdressers at Heart; a Commissioner for Prince George’s County Commission for Women and a proud wife and mother of three adult children. 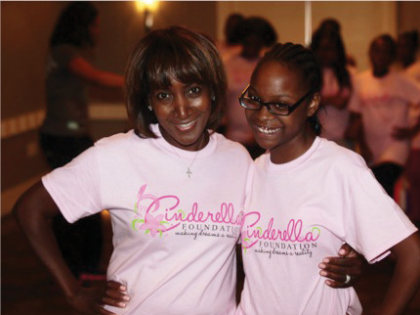 A non-profit, 100% volunteer-driven, 501c(3) organization. Founded in 2002 from one person’s vision to inspire, educate and empower underprivileged girls and young women to transform lives and make their dreams a reality. 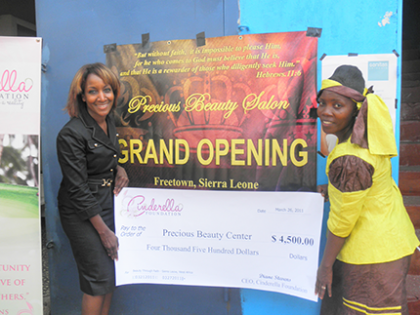 Cinderella Foundation presents check to the Precious Beauty Center in Sierra Leone.